Accepting registration for spring classes now! Our passion is bringing the joy of music to families across the South Bay communities of Southern California. Music learning supports all learning. It enhances a child’s language, cognitive, emotional, social, and physical development. This comprehensive music program offers your child a high level of music education through open expression, exploration, and play. 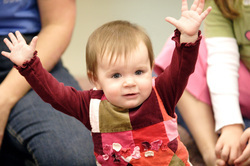 Music Together is an internationally recognized early childhood music program for babies, toddlers, preschoolers, kindergartners, first and second graders, and the adults who love them. First offered to the public in 1987, it pioneered the concept of a research-based, developmentally appropriate early childhood music curriculum that strongly emphasizes and facilitates adult involvement. For class schedules, prices, and sign-up, please click here. If you would like to experience a FREE Demo, please contact us for current availability at SouthBayMT@gmail.com.